Autograph signature "Tho. Baker. Coll. Jo: Socius Ejectus". On paper piece measuring approx 5 x 1.5 inches (12.5 x 4 cms). 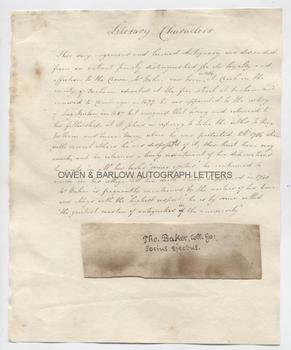 Tipped onto larger leaf bearing the biographical details of Thomas Baker as compiled by and in the hand of Anne Susanna Nichols (1788-1853). Some browning, else in very good condition. Thomas Baker was one of the great antiquaries of his day and the majority of his extensive collection of manuscripts is now housed in the British Library and Cambridge University. These include books printed by Caxton and other priceless manuscripts and examples of early printing and literature. He graduated from St. John's in 1678 and became a fellow of the college shortly after. He spent most of his life at St. John's but was stripped of his fellowship following his refusal to swear an Oath of Loyalty to William III. From then on, Thomas Baker always signed himself in his books and manuscripts "Socius Ejectus" to show his distress at the removal of his fellowship. Provenance: From the Georgian album compiled by Anne Susanna Nichols (1788-1853), daughter of the eminent printer and antiquarian John Nichols (1745-1826). Nichols was an intimate friend of Dr. Johnson, Horace Walpole and other literary figures and accumulated a huge quntity of literary and historical documents, now housed in the British Library, the Bodleian Library and elsewhere. He encouraged his daughter in her collecting of autographs and contributed several to her collection.